Going out for Halloween (or just any ordinary day) dressed as a pirate? Make sure you have everything you need. You should already have your pirate costume, black or brown boots, and pirate hat on. You’ve got accessories like a pirate sword, an eye patch, compass and telescope for navigating the high seas. But what is it that you’re looking for in your adventures on the water? Treasure! How are you going to find the treasure without a treasure map? No worries, you can just get this treasure map accessory and you’ll know exactly where that gold can be found. 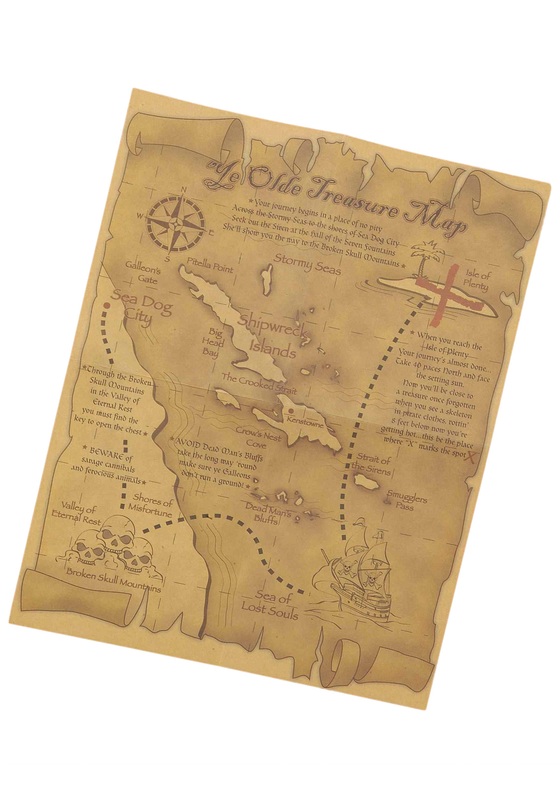 This treasure map will take you from Sea Dog City through the Broken Skull Mountains, around the Shipwreck Islands to the Isle of Plenty. Sure, you could try going straight through the Shipwreck Islands, but there is a reason they’re called that. Dress up in your pirate costume and complete your hunt for treasure with this treasure map accessory!